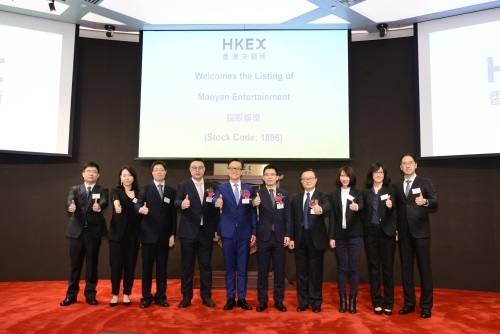 HONG KONG – (ACN Newswire) – As the movie and entertainment market in China gears up to embrace the Chinese New Year holiday, one of its busiest seasons of the year, Maoyan Entertainment, a leading platform providing innovative Internet-empowered entertainment services, is celebrating its listing today on the Stock Exchange of Hong Kong. The stock code for Maoyan is 1896, which has special meaning for Maoyan as it is the year that the movie industry started in China. Maoyan is now the largest online movie ticketing platform in China, with monthly active users (MAU) averaging 134.6 million and a market share of 61.3%, as measured by GMV of movie tickets sold in the first nine months of 2018, according to the iResearch Report. It is also the second largest ticketing services provider for entertainment events in China. As a one-stop entertainment consumption platform, consumers can easily discover content and make informed decisions based on a wealth of entertainment information, user-generated ratings and commentaries. They can enjoy comprehensive entertainment services, including ticketing, IP-derivative merchandise and in-venue food and beverage pre-ordering. 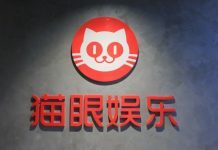 Maoyan was the first in China to provide Internet-based promotion and distribution services for movies and has since expanded such services to a broad range of entertainment content. Maoyan has become the largest lead distributor of domestic movies in terms of China gross box office. In the first nine months of 2018, Maoyan provided entertainment content services for movies that contributed to over 90% of the gross box office in China. 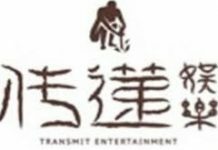 The powerful network effects have shaped Maoyan’s ability to capture commercial opportunities arising from its ecosystem and expand to attractive business areas along the entertainment value chain and across entertainment formats, further enhancing its growth potential, added Zheng. With strategic partnerships with Tencent, a leading social media platform, and Meituan Dianping, a leading e-commerce platform for services, consumers can easily access Maoyan’s platform through Tencent’s Weixin and QQ apps, Meituan app and Dianping app. 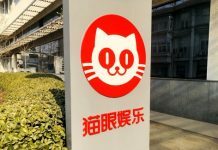 “We will continue to strengthen our business cooperation with both Tencent and Meituan Dianping because the strategic partnerships will give us a competitive advantage in respect of user traffic and media resources and further strengthen our market position,” said Zheng. Besides user access, Maoyan has also developed close partnerships on content resources with leading content producers in China, including Huanxi Media Group, Mahua Fun Age, Edko Films and New Classics Media, etc. In its strategic partnership with Huanxi Media Group, Maoyan has the right to investment and exclusive distribution and promotion right to all movies, TV series and online shows from Huanxi Media Group. “As a public company, Maoyan will continue to empower the entertainment industry with better products and services and grow together with the industry,” said Zheng.